This tutorial offers two creative ways to get your message across. These attractive, yet simple folds give your invitations, announcements, greetings, and everyday letters added impact that will make your friends and colleagues take special notice. Create a professional-looking, dynamic envelope in just a few folds. Add ambiance and a soft glow to any room by creating your own original luminaries. Using some card stock, translucent paper, and a few folds, luminaries can be used once or stored flat and brought out for occasions when you want to bask in the glow. Simple yet dramatic, luminaries transform the feeling of a room. Have incomplete playing decks laying around? Love the design of your grandparent's cards? 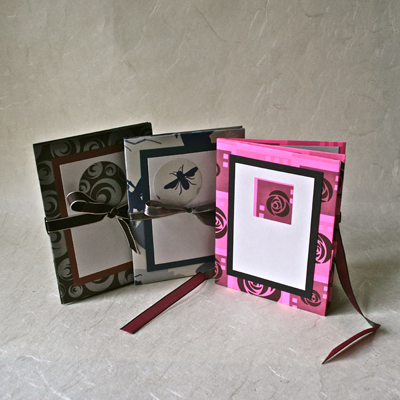 Use them to make small books great for doodling, to give as gifts, and for capturing those traveling thoughts. A natural for photos, poetry, coupons, invitations, or greetings, you can alter this technique to create Pocket Books of different sizes and for unique occasions such as a wedding. Surprise the recipient with what you put inside. With a few strategic folds, you can turn small pieces of paper into nesting boxes perfect for holding jewelry, small gifts, and other hidden treasures. All you need is a firm fold, some fun paper to work with, and these instructions. The inner accordion presents and stores select content. With a few key folds, the origami bowl takes shape quickly and impressively. Using different sized papers, you can nest several bowls together. The origami bowl is great for storing special things. Avoid the hassle and expense of gift bags by making your own. Transform old maps, craft paper, grocery bags, and fun papers you've got laying around into wrapping that's personalized and memorable. When you work with paper, you get to know glue. But not all adhesives are equal or appropriate for various projects. Our Guide to Glue helps you know the virtues and vices of what's on the market today.